What breeds should you consider? Reputation is carcass and maternal. Also has a reputation for growth. "They wanted to be everything to everybody," he said. The problem with this is the increased mature size in these growthier Angus cattle. Reputation for carcass and maternal. Before the 1950s, all Angus were Angus, regardless of coat color. 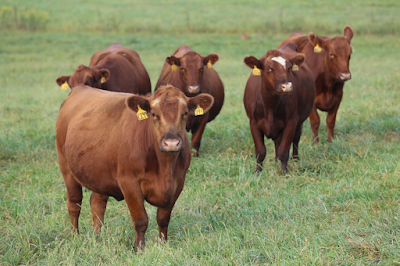 The Red Angus breed has not chased growth as much as black Angus. Reputation for maternal, easy fleshing, and longevity. Hereford don't typically have a lot of maintenance requirements. Reputation as maternal and carcass. Shorthorn was previously a dual purpose breed of meat and milk. This is why Shorthorns have been used in a lot of composites such as Santa Gertrudis. Reputation for maternal and growth. Reputation for growth and lean tissue. Great for yield grade. Reputation for growth, but they also do a decent job on quality grade. Maternal, lean, hardiness, insect, disease and heat tolerance. Reputation for hardiness and lean beef. Horns are a by-product that can marketed to hang in steak houses. Reputation for hardiness and roping stock. Once referred to as a goat in a beef cattle hide. Often used for calving ease, but their are probably better options to get calving ease without the discounts for Corriente cattle. Larger framed than Waygu. Known for marbling and fertility. There are more breeds out there can you can imagine. Mix of Brahman and Shorthorn. Has to fit breed type to be registered. Maternal heterosis and growth. Longevity, fertility and efficiency. Can be any color. Carcass, Growth, Maternal and Heat Tolerance. Hereford and Angus hybrid. Great longevity and maternal. F1 Tiger Stripe with Angus influence. Brangus and Angus cross. Less Brahman influence than Brangus. Crossbreeding leads to increased hybrid vigor, also known as heterosis. Crossbreeding can lead to a lack of uniformity. We have now gone towards a straight breeding program. Straightbreeding has lead to increase consumer acceptance and carcass quality, but we have also lost some fertility and stress tolerance. Maximum heterosis is achieved by an F1 x F1 cross. This has grandparent from 4 unrelated breeds. However, this may decease uniformity, especially in multiple bull herds. 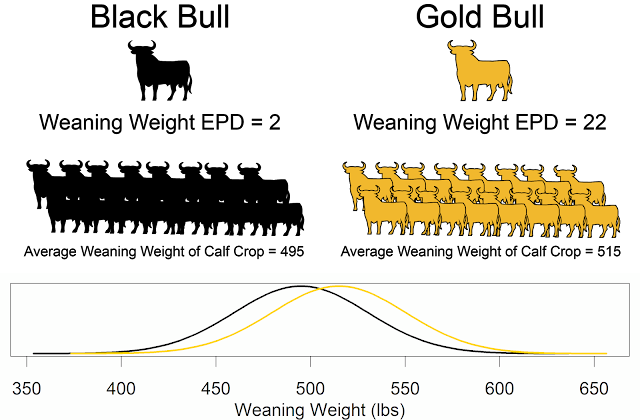 Maternal hybrid vigor increases calving rate (6%), weaning rate (8%), weaning weight (6%), and a negligible 2% increase in birth weight. Cow lifetime productivity is increased by 25% due to heterosis. Keep in mind that some crossbred cows are larger than their straightbreed counterparts. May need to adjust stocking rates appropriately. "What is that ideal cow? I don't care what color she is," Wells said. The cow needs to fit our environment and our resources. Must be able to manage for the benefits. Heterosis will not make up for poor animal husbandry/management. Heterosis will not make up for poor bull selection. *Note, this post was live blogged and may contain mistakes.